Next you need to determine the angle of inclination you are going to utilize. This is the tilt angle whereby vertical is 90 degrees and horizontal is 0 degrees. 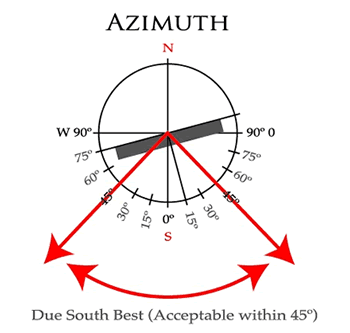 This inclination angle will play a role in determining the performance during the seasons. If you use a steep angle you will have better relative performance during the winter when the sun is at a lower angle. This is a great strategy for application that requires maximum collection performance in the winter. However, if you are looking for the best annual average performance, then the rule of thumb is to tilt the collectors at an angle equal to the geographical latitude. This means the further North you go the steeper (more vertical) the installation should be. NOTE: With solar vacuum tubes the angle of inclination and azimuth do affect output, but this is not anywhere as critical as it is with photovoltaic (PV) panels. Don’t worry if the collector tubes are not at the absolute perfect angle, as long as you are within a +/- 10 degrees of the best inclination at the season you need the maximum power output and azimuth is between south-west to south- east, you will still get decent results for solar heating. This is because the roundness of the tubes minimizes the off-azimuth effect. The reduction in solar power density, if the panel is not square (not incident at 90°) to the sun’s rays, is a cosine function. For example, if the angle is 80°, instead of 90°, the sun intensity is still 98% (i.e., cos10°). Even when 30° off (i.e., an incident angle is 60° instead of 90°, the intensity is still 87% from what it would be if the angle was ideal. The rule of thumb when calculating the angle of a solar collector to make the angle of inclination equal to the locations degree of latitude will produce the best overall annual heat output. This however, may produce too much excess heat in the summer and not enough heat in the winter. The sun’s noon angle will vary +/- 23.5 degrees throughout the year, being at an angle of 90°- latitude at the equinox (Mar 21 and Sept 21), and +23.5° higher than this at the summer solstice (Jun 21) and -23.5° lower at winter solstice (Dec 21). This variation is a sinusoidal with the average value being the same as the latitude degrees. 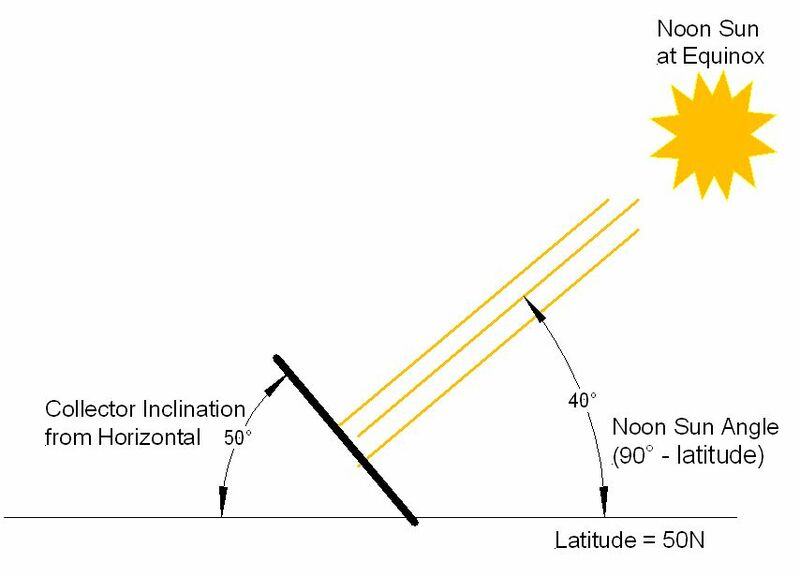 That is why positioning the solar collector at the same angle of inclination as the degrees of latitude produces the best results for a yearly average, not considering weather effects. 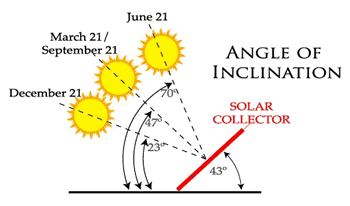 When calculating the angle of a solar collector, Considerable change can be obtained by being aware of what happens to seasonal power output if the inclination is more towards vertical or more towards horizontal. Take the 50-degree latitude situation, for example (Winnipeg, Canada). Best overall annual output would be obtained if the angle of inclination is made 50° from horizontal. However, if the application is a space heating application, you are interested in maximizing the output during the heating(winter) season and minimizing the output during the cooling (summer) season. 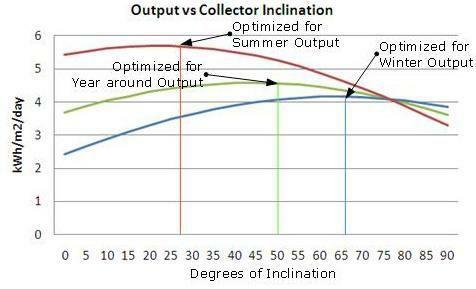 This can be done by increasing the collector angle by 17 degrees. The graph below shows how the average daily output can be made to vary by focusing on the season that the heat is targeted at. The green curve is the average daily output focused at year around results. As you can see the peak occurs at an inclination of around 50°, which is indeed the latitude at Winnipeg Canada. This inclination would be a good one for a hot water application, such as a car wash. The blue graph only uses data from October 1 to April 30 a period of 7 month. This, for Winnipeg, would be the home heating season. The peak occurs at approx. 66 degrees. This would be a good inclination for a heating application such as in-floor heating. The red graph only uses data from May 1 to September 30th a period of 5 month. The peak in this case occurs at about 27 degrees. This would be the angle the collectors should be set at if the main purpose was to heat a pool. Also note, that for the winter heating situation (blue graph), the results remain good at the high angles. Decent results are obtained over the entire range of 50-90°. Similar for the summer heating situation (red graph) the results remain good at the low angles. Decent results are obtained from 0° to about 35°. For the year around situation good results are obtained in the mid-range of 35° to 65°. The above graphs were produced using a simulation program, RET Screen that uses actual meteorological and NASA data for Winnipeg, rather than just theoretical sun radiation data.